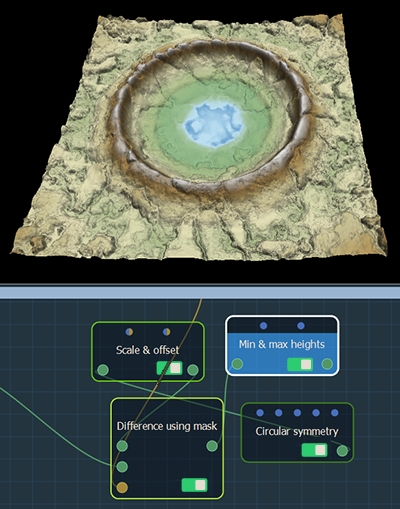 The Terrain transformation nodes modify the terrain. Change size: This node changes the size and resolution of a terrain. Smooth: This node smooths a terrain by replacing the height of a vertex by the average of the height of its neighbors. Scale & offset: This node sets the scale and offset of the terrain. Min & max heights: This node modifies the minimum and maximum heights of a terrain. Apply curve: This node modifies the terrain profile by changing the heights of all the vertices on a curve that define the terrain heights. Transform terrain: This node modifies the first terrain before it is inserted into a second terrain.